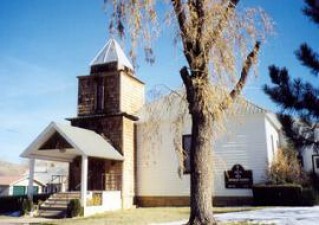 St. Rita of Cascia church is located in the town of Mancos in the beautiful Mancos Valley. It is a place of worship for a small but vibrant community. Members have served each other and the wider community for more than a century. When Fr. 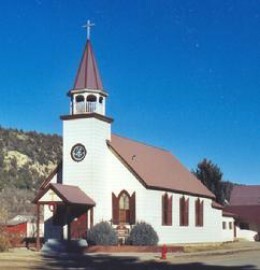 Joseph Brunner arrived in 1913, there was no Catholic Church in Mancos. 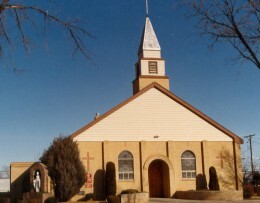 Mass was held in the homes of the faithful. Very soon, Fr. 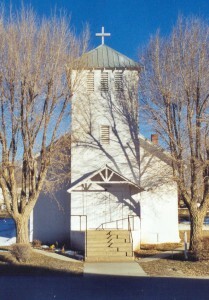 Brunner purchased an abandoned Baptist Church that had been built in 1893. This building has been cared for over the years with great love and devotion and remains a beautiful place of worship. In June 2012 stained glass windows were installed. Bishop Fernando Isern came to bless the new windows and celebration with the whole community. The new windows depict: St. Rita of Cascia; Jesus’ baptism by John the Baptist; Jesus the carpenter; the flight into Egypt by Joseph, Mary and Jesus; St. Isadore, patron of farmers, Our Lady of Guadalupe; Jesus healing a blind man; Jesus and the children. St. Rita of Cascia was a 14th Century Italian saint. She is the patroness of lost and impossible causes, difficult marriages and families. Her feast day is May 22.